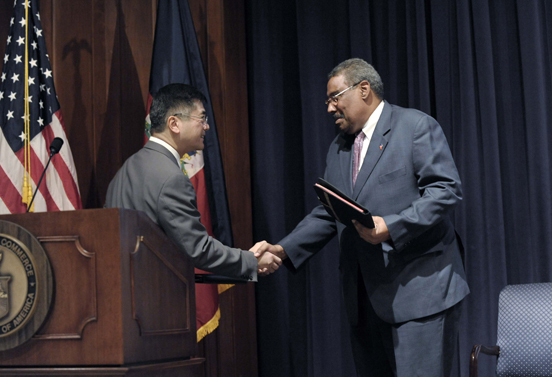 U.S. Commerce Secretary Gary Locke reaffirmed the support of the Obama administration and the Commerce Department for Haiti’s reconstruction efforts following January’s devastating earthquake at today’s Haiti Reconstruction Business Dialogue hosted at the Department. Locke was joined by senior government and private sector representatives to discuss how American companies can help aid Haiti’s reconstruction efforts. Haitian Minister of Tourism Patrick Delatour, who is charged with leading Haiti’s reconstruction efforts, briefed businesses on the country’s pressing needs. January’s earthquake, which resulted in more than 230,000 lives lost, ranked among the 10 worst natural disasters in recorded history, and the worst in the Western Hemisphere. A recent study by the Inter-American Development Bank estimates reconstruction costs at between $8 billion and $14 billion. The Haitian Government’s Action Plan for National Recovery and Development of Haiti highlights the revitalization of five sectors: agriculture, farming, textiles, tourism and urban housing/development. The Department is planning other outreach events in New York, Miami and Philadelphia to engage the U.S. private sector and the Haitian diaspora.